Children love to have mentors read them stories! Change a child's life in just one hour every week-be an Everybody Wins! 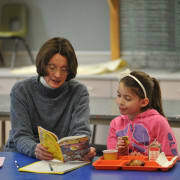 reading mentor at one of 23 schools in Vermont and the Upper Valley of New Hampshire.